I dunno, when i was in Istabul I was hardly aware there even was a metro... i never saw any signs or nothing. Though, I later found out there was one... but I never rode it. I just noticed you have the wrong image for London..... Not sure how I missed that until now... but this is correct image..
Bruceswar wrote: I just noticed you have the wrong image for London..... Not sure how I missed that until now... but this is correct image.. I just want to confirm, the changes... its the new impassable added and the numbers taken out right? CJ Lues wrote: My entry is in!!! MrBenn wrote: Host your map files (one entry per contestant please) using Photobucket, imageshack or some other file sharing program, and provide a link to Industrial Helix by CC Time: 2011-05-10 18:59:59. 1h 30min left to enter the contest! So what's up with the phase two? it's near 4 days that submitting is finished! All entries must be submitted by May 10th, 2011. Entries will be shortlisted by the foundry staff and a vote of the best maps will commence within five days of deadline. All submissions will be anonymous until a clear winner has been determined. Please submit both large and small images via PM to, yours truly, Industrial Helix. Another phase of this contest has concluded. Certainly you have noticed that 3 of these maps represent London so, instead of start immediately a poll to elect the winner map of this competition, the Blue Guys have decided to start a special poll and give everyone the opportunity to vote which of the three maps of London is the best one. The poll will run just for 1 week, so com'on! Visit the dedicated topic and vote for the best map! See you here again in a week...or so. World Cities Contest: Pick your favourite London Map! 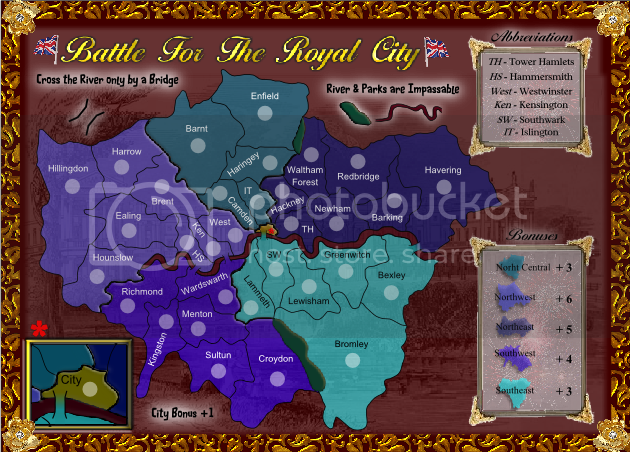 after a week of voting, the ConquerClub Community has spoken, the most voted map of London is the MAP1. Thanks to everyone for taking part and voting, I hope you enjoy the rest of the competition. Like announced in the official topic of the competition, since we have 3 different graphical representations of London, we decided to start a poll to understand which of these maps the Conquer Club Community like the most. The poll will run for a week and everyone can vote, but be careful because you have just a single vote. So make your choice carefully! Which is your favourite London Map? After a week of voting, the London map with most votes will be picked to participate to the final poll to elect the overall winner of the competition. I love the perspective on #1 and I think it's a nice new style. #2 is okay, the color scheme reminds me of England, which is both good and bad - good, in that it ties the two together nicely, bad in that it's graphically not all that fresh. Also, will there be a headline for this soon? I agree about the perspective on #1, but for me, it is very reminiscent of the Great Lakes map (not really a bad thing, as I like that map), and it seems to have dropped the Southwark label off the small map. #2 is just a bit too green for me, although I do like the skyline silhouette. The border on #3 is pretty snappy, but the corners on the legends are a bit much for me and I am not fond of the colour scheme. All in all, I am voting for #1.
ender516 wrote: I agree about the perspective on #1, but for me, it is very reminiscent of the Great Lakes map (not really a bad thing, as I like that map), and it seems to have dropped the Southwark label off the small map. #2 is just a bit too green for me, although I do like the skyline silhouette. The border on #3 is pretty snappy, but the corners on the legends are a bit much for me and I am not fond of the colour scheme. All in all, I am voting for #1. #1 is not terrible, but the black and white does not really mesh with the rest of the map. #2 is my pick. Yeah it may seem a bit green, but I think this will look great once you add all of those colorful numbers on it. #3 is just a bit too Gaudy for my taste. Map number 1 has at least 3 spelling mistakes, but it's my favourite graphically. They all need some proofreading. Also, I notice that the abbreviations for some areas are different in different maps. Are there any abbreviations that are standard for London neighborhoods, or boroughs, or whatever they call them? ComposerNate wrote: They all need some proofreading. Also, I notice that the abbreviations for some areas are different in different maps. Are there any abbreviations that are standard for London neighborhoods, or boroughs, or whatever they call them? I'm not so sure - they are definitely Boroughs, which is similar to a county. 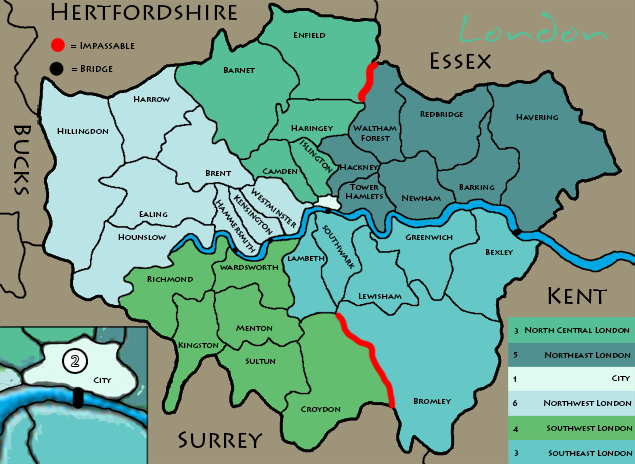 A London Borough's average population is 8,000,000 / 35 - slightly bigger than a neighbourhood. I don't like the brown Thames on map 3 (like it's made of londonian poops).